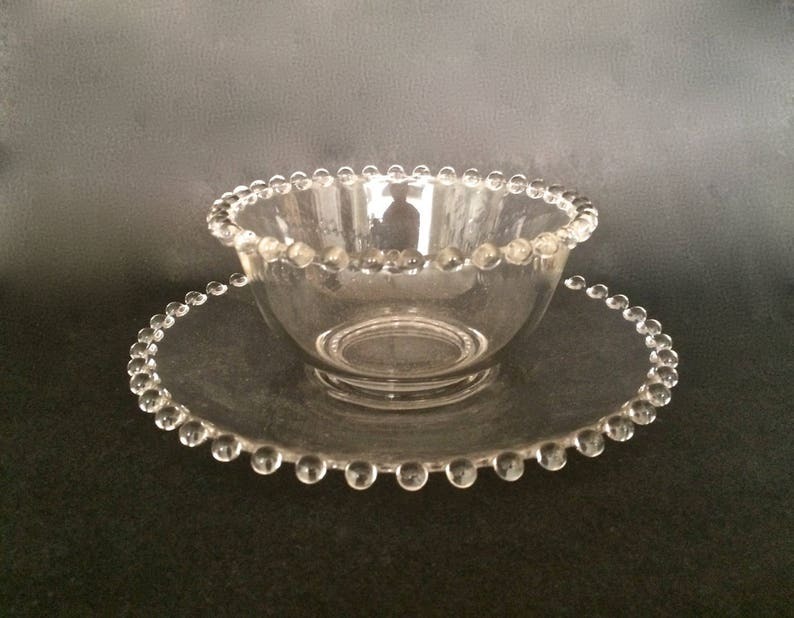 The Candlewick pattern of glassware with its distinctive rows of ball trim is one of the American Imperial Glass Company's most well known and popular patterns. Between the years of 1936 and 1984 a wide variety of different kinds of candlewick glass pieces were produced to provide decorative interest and sparkle while serving very practical purposes as part of table settings both casual and formal. This is a relatively modest sized but deep bowl - 5" diameter x 2 1/4" high - with a serving and drip plate underneath that measures 7 1/4" wide x 3/4"high. The bowl would work well for serving sauces with a ladle as well as many other foods. The pieces are attractively proportioned and in excellent vintage condition. It would make a great addition to a candlewick collection as well as a wonderful piece for your table or to give as a gift. The pieces are priced separately so that you can the piece of your choice or both pieces. Use the toggles to the right of the photos to make your selection.